We are proud to share that the final donations from Fandom Rocks have been delivered to the charities chosen by the fans for this campaign. Fans raised a total of $3350 USD during the campaign which means the American Foundation for Suicide Prevention and the American Cancer Society each received a check for $1675 USD. The donation to the American Cancer Society was delivered to the local office in Champaign, Illinois, in memory of Kim Manners. Supernatural fans wanted to express once more how much Kim is loved and will be missed. Everyone behind Fandom Rocks would like to thank you for your support over the past few years. It has been an amazing experience working with you to help charities around the world. We have gained tremendous personal experiences when communicating with our charities via email, phone, and even on road trips to see our donations made in person. Please accept our sincerest thanks. We’re closing the doors now. I bring happy and sad tidings. In just a few weeks, we will officially dissolve the non-profit corporation we created for Fandom Rocks. However, in that same time frame we will make our final donation to the charities you selected. So far, everyone out there has helped raise $3,000 USD. Can we add some on top of that to make the donations, say, an even $2,000 for each charity? 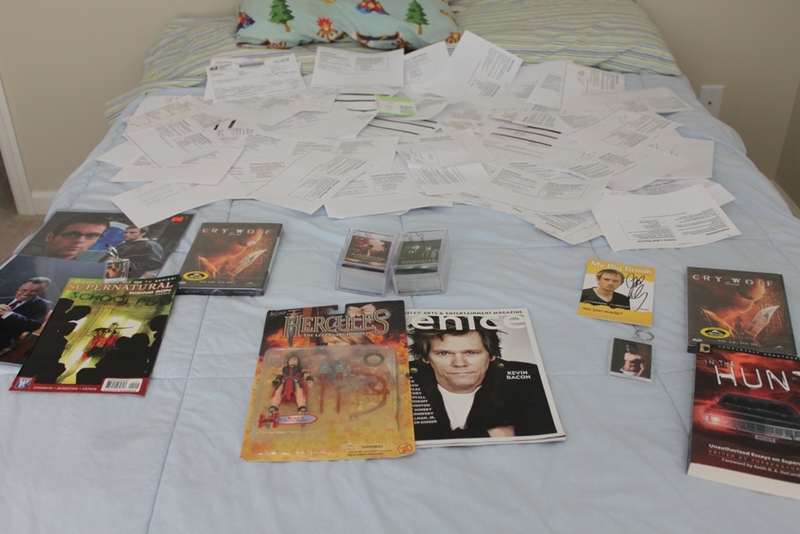 Check out all of the receipts from our auction! The auction was a huge part of the success of the fifth campaign. To try to make that happen, we are offering that remaining auction items that were not won or paid for, plus a couple of DVDs a fan generously contributed to the cause. For every $10 you donate between now and February 14, you will receive one entry in a random drawing to win your choice of the three sets of prizes pictured below. Donate $50 and we will give you an extra entry! $50 = 6 entries! And so on. Thank you for your support for the last few years. I am very proud we lasted this long and came together as a fandom to help a number of charities. Please help us one last time to make the last campaign for Fandom Rocks a success! Today is the last day to enter our prize drawing! Every $4 donation is one entry into the drawing. We will draw the winners on December 10th to allow any mailed entries to arrive. Don’t miss out! Fandom Rocks has enrolled in a number of programs to assist with administrative costs. Read on to learn how you can help Fandom Rocks by searching, shopping, and playing online. Search the web using GoodSearch.com. There is a dropdown on the page that displays the charity you are contributing to. You can also add a toolbar to your browser for easier searching, or make GoodSearch your homepage. Shop the web using GoodShop.com. You don’t have to register or give them your information! Just click and shop. Start your Amazon shopping from one of our links. Even if you purchase shoes, as long as you start from one of our links, Amazon remembers that we sent you to their site and gives us credit for your purchase. Be sure to check out their Black Friday Deals – still going on now! – SPN Season 1 DVDs currently on sale for only $17.49! – SPN Season 2 DVDs currently on sale for only $17.49! – SPN Season 3 DVDs currently on sale for only $14.99! Pick up a gift from our Cafe Press store. How do I participate in the IWON Team Challenge? Either Join a team from one of our National Charity Teams and help a national charity win $10,000 or create your own Member-Created Team and get your friends to help you win $10,000 for your favorite cause! Who will win the IWON Team Challenge? The teams with the most coins will win each month. At the end of each month there will be one $10,000 winner for the National Charity Teams and one $10,000 winner for the Member-CreatedTeams. How do I earn coins for my Team? All of the coins you earn after joining a Team are immediately added to your Team’s Coin balance. Best of all, you can still use those coins to enter Sweepstakes and advance on your IWON Game Boards! Will I win the money if my Team wins the IWON Team Challenge? No, IWON will send checks directly to the organizations, beneficiaries, or the Team Creators. What are the limitations on earning coins for the contest? You can earn up to 1,000,000 coins for playing Casino games, 200,000 coins for regular coin-awarding games, 20,000 coins from Ask Search, and 3,000 coins from using Tell-a-Friend. IWON reserves the right to disqualify any entries by persons or teams determined to be tampering with or abusing any aspect of the contest. The officer elections officially closed on August 1st. Congratulations to our Board of Directors and welcome aboard to the new folks. The original Frontliners cannot express how much we appreciate you joining us in this venture. We hope other Fandom Rockers will chime in with a congratulations and welcome, too. We will discuss open positions and determining how to fill them or if they are still necessary at an upcoming meeting. If you would like to join our meetings, download and install Skype, and send Dana (roniabirk on Skype) a message. We still have open positions. If you are interested in becoming more involved with Fandom Rocks, please see the nomination post. At this time, voting is open for President, President-Elect, Treasurer, Secretary, and Marketing Advisor. Voting will remain open until the end of July. Please check back for additional polls as more nominations are submitted. Fandom Rocks is powered by	WordPress 4.9.10 and delivered to you in 1.402 seconds using 26 queries.